Texas science teachers will no longer be required to teach weaknesses of scientific theory, including evolution, under new curriculum standards tentatively adopted by the Board of Education Thursday. The requirements were approved Friday by the State Board of Education in a 13-2 vote adopting new state science curriculum standards that will be in place for the next decade. In a compromise plan, teachers will be required to have students scrutinize “all sides” of scientific theories, a move criticized by evolution proponents. The vote caps a week of impassioned debate that had scientists, teachers and textbook publishers from around the country focused on Texas. Supporters of evolution hailed the vote but were critical of amendments adopted by the board that they said could create new paths to teaching creationism and the similar theory of intelligent design in public schools. If given final approval in a vote expected Friday, the new standards will drop a 20-year-old rule that requires both “strengths and weaknesses” of all scientific theories to be taught. Critics say the requirement is used to undermine the theory of evolution in favor of religious teachings. The new standards, which would be in place for the next decade, govern what appears on standardized tests and material published in textbooks. As one of the largest textbook purchasers in the nation, Texas has significant influence over the content of books marketed across the country. “Publishers are waiting to hear what to put in their textbooks,” said Dan Quinn, a spokesman for the watchdog group Texas Freedom Network. Federal courts have ruled against teaching public schools teaching creationism and intelligent design, which holds that life is so complex that it must have come from an intelligent higher power. The trailer for ‘Where the Wild Things Are’ has dropped onto the net. You can find various high quality versions over at Quicktime. I know there has been a lot of fuss over this film. The trailer was originally attached to the Grinch way back in 2000. Spike Jonze, who directed the picture, had several issues with the way Universal was handling the flick and took it to Warner Brothers shortly thereafter. It was shot in 2006, but in 2008 rumors began dropping on to various websites that Warner Brothers was considering reshooting the entire film. Alas, all was sorted in the end and the film is now marked for an October 16, 2009 release. Photo of the Day – History. Animated. Thanks to Dr. B for sending me this great, evolution related gift. The Cartoon History of the Universe is written and illustrated by American cartoonist, professor, and mathematician Larry Gonick. The Cheddar Man museum features this faux skeleton as its final exhibition piece. At first I thought it might be the Shanidar skeleton, what with all the flowers, but the skeletal morphology is clearly not Neanderthal. 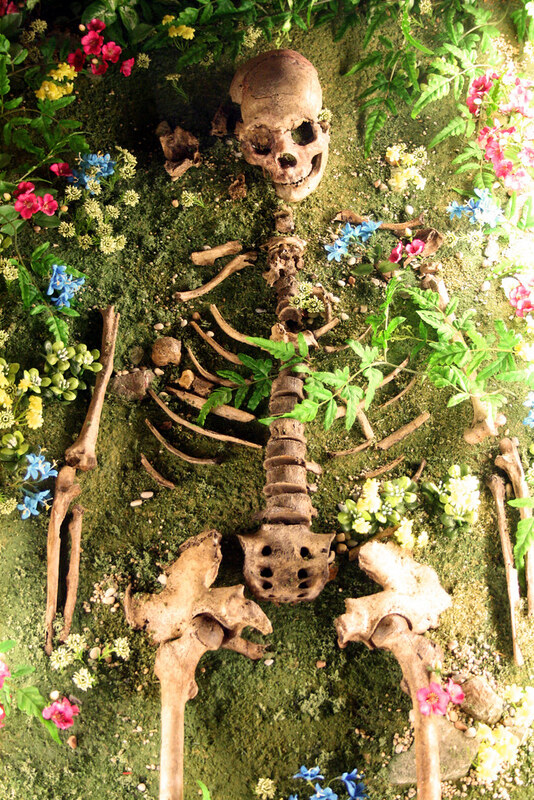 Then I thought it may be the Cheddar man, but he was buried inside the cave, where flowers don’t necessarily flourish. So I’ve resolved to think that it’s just the remains of some prehistoric hippie. A live-action TV series set in the “Star Wars” cosmos has been an elusive, tantalizing prospect for years. News of the potential production first surfaced in 2005 while George Lucas was promoting “Revenge of the Sith.” Work on the “Clones Wars” animated feature film and Cartoon Network series, though, took creative precedence. In late 2007, Lucas revealed that he and his team were about to begin writing scripts for the live-action show. Now MTV News has learned that casting for the series is currently underway. During the junket for the Nicolas Cage thriller “Knowing,” star Rose Byrne let slip that Team Lucas is casting a wide net for actors to join the show. “A lot of my friends have been auditioning for it,” she said. According to Lucas, the show will focus on minor characters from the saga and be set in the time period between “Revenge of the Sith” (Episode III) and the original “Star Wars” (Episode IV). The action will follow the Rebel Alliance as it slowly gains strength against the Empire. There will be Stormtroopers, but no Jedi or Darth Vader will appear on screen. As he did with the “Clone Wars” series, Lucas will write and shoot an entire year’s worth of episodes before looking for a cable channel on which to air the series. Thus, with casting just now moving forward, it looks to be quite some time before fans will be able to catch some live-action “Star Wars” on the small screen. Who would you like to see cast in a live-action “Star Wars” TV show? Which cable channel would be the best outlet for the series?